Some elected lawmakers in New York say they'll be boycotting President-elect Donald Trump's inauguration on Friday. "I'm not going down there [to Washington] this weekend," freshman Harlem congressman Adriano Espaillat said Monday. "I choose to stand with John Lewis." Lewis, who's served in Congress for three decades, has questioned Trump's legitimacy as president and said last week he plans to boycott Trumps' inauguration. Trump responded to Lewis' remarks by tweeting: "Congressman John Lewis should spend more time on fixing and helping his district, which is in horrible shape and falling apart (not to mention crime infested) rather than falsely complaining about the election results. All talk, talk, talk - no action or results. Sad!" Four days and counting until Donald Trump is sworn in as America’s 45th president and the fallout continues over the battle between the president-elect and Rep. John Lewis. The congressman is one of more than a dozen Democrats now planning a boycott of the inauguration. Melissa Russo reports. Brooklyn congresswoman Yvette Clark said Trump has insulted America by insulting Lewis -- a civil rights leader who was one of the organizers of 1963's March on Washington -- and says she'll be boycotting the inauguration. In Espaillat's Harlem district, constituents say they understand why he's taking a stand, but not everyone agrees. "On the one hand, I can embrace the integrity to not support the cause," said Quinton Chad Foster. "On the other hand, I think you get out in a position where you have to support who is in charge." Meanwhile, Mayor de Blasio, the Rev. Al Sharpton and celebrities including Mark Ruffalo, Michael Moore and Rosie Perez are planning to rally New Yorkers to stand up to President-elect Donald Trump on the eve of his inauguration, organizers say. Organizers say they expect thousands of New Yorkers to attend the event, put together by groups including Greenpeace and the liberal activist organization MoveOn, on Trump's home turf. The demonstration is intended as a kick-off to organizing opposition to Trump's policies and support for cities taking their own approach on immigration, climate change, health care, workers' rights and other issues. "We are sending a message to Washington that we will fight, at every step, discrimination and harmful policies, today, tomorrow and every day," Ruffalo said in a statement. He said participants "are coming together to stand up for one another, as we will do every day, to protect the values we hold dear." The demonstration also aims to spotlight actions that cities can take locally, such as working on their own to reduce carbon dioxide emissions. The Republican president-elect's choice for Environmental Protection Agency administrator, current Oklahoma Attorney General Scott Pruitt, has questioned the science showing that the planet is warming and that man-made emissions of carbon dioxide and other greenhouse gases are to blame. Demonstrators plan to rally outside the Trump-developed Trump International Hotel and Tower. It's a half-mile from Trump Tower, the president-elect's home. That's where Martin Luther King Jr's son met with the president-elect on the day honoring the slain civil rights icon. 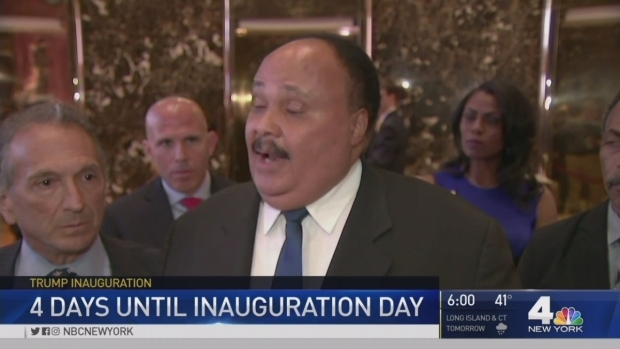 "In the heat of emotion, a lot of things get said on both sides," Martin Luther King III said. "And I think at some point -- I am, and as John Lewis and many others are -- a bridged building. The goal is to bring America together, and Americans." Plenty of local Democratic officials will still be attending the inauguration, however. Rockland and Westchester Rep. Nita Lowey said in a statement to NBC 4, "Out of respect for our nation's democratic institutions and the peaceful transfer of power, Congresswoman Lowey is planning to attend the Inauguration."